She was seen first after the great railway crash of ’59. They called her the ‘ghost of the railway tracks’. No-one knew if she was one of the victims of that crash, though we all suspected it. But which of the names on the manifest would have been hers? There were 35 woman killed in that crash. 35 women, 13 children and 28 men. Then, when we saw her again, it was more terrible still. For she did not come at random, and she did not come often. But when she came it always foretold disaster. Not always a train wreck, though that was sometimes her gift. And not always in our town, as we came to see. Wars came in her wake, acts of terrorism, plagues. We never knew what would strike, only when, because her ghostly form appeared as the herald of it all. I saw her once, quite close up. I was very young then, but a child playing on the tracks. She was weeping when I saw her. I suppose she always did. About what killed her and about what was to come. I feared seeing her meant it was personal, and someone close to me would be taken. or perhaps I would die, before I’d had a chance to live. But no, it was far way, and in a far grander city than my little town. Twin Towers fell, and so many with them, into the inky black night that must be her home. When I knew I wept too, as the whole world seemed to weep. And now, more than a decade later, real fear stalks our town and our world. For she comes, every day, every day. And in the world the violence escalates, the hatred and bigotry and death. 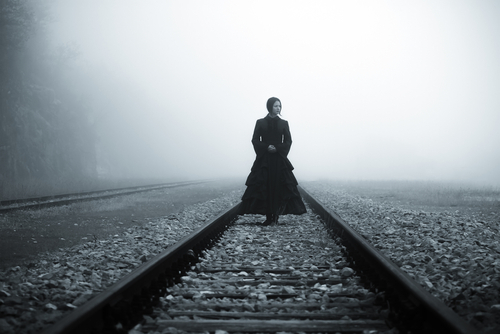 The ghost of the railway tracks is ubiquitous, and we know the end must be soon. And when she weeps, we weep with her. This entry was posted in Horror Flash Fiction and tagged ghost, ghostly warning, horror flash fiction, Twin Towers, worlds end. Bookmark the permalink. OOOOh Chilling. Loved it, Helen.